Patrik Laine wants to hoist the Stanley Cup, but drinking champagne out of the hallowed trophy is another matter. WINNIPEG — Patrik Laine wants to hoist the Stanley Cup, but drinking champagne out of the hallowed trophy is another matter. The Winnipeg Jets star sniper doesn't drink alcohol. Never has. So what happens if he wins the NHL championship and the champagne-filled mug is passed to players for a celebratory drink? "I'll probably drink something else. We'll see," Laine said Sunday prior to scoring twice in Winnipeg's 4-2 victory over the Dallas Stars. The 19-year-old's abstinence from alcohol is a personal choice, part of his plan to excel at hockey. "I don't think that's going to help me to be a better player," he explained in his usual matter-of-fact manner. "I want to do everything I can to be the best player I can. I don't need to do that. That's not going to help me so I don't feel like I have to do that." There's no arguing the talented teetotaller's pursuit of excellence has been working ever since he left formal schooling at age 16 to focus full-time on hockey. After being drafted second overall in 2016 by the Jets, the six-foot-five, 206-pound Finnish phenom made headlines in his first season with his powerful laser shot, culminating in 36 goals and 64 points in 73 games to garner a nod as a finalist for rookie of the year. Last summer, he worked to become stronger and improve other parts of his game. Now the Jets are humming toward their second playoff appearance since relocating to Winnipeg from Atlanta in 2011 and Laine is in the running for the Maurice Richard Trophy, given to the league's top goal scorer. His two-goal output against Dallas gave him 43, tying him with boyhood idol Alex Ovechkin of the Washington Capitals. Laine's racked up 68 points in 72 games and is riding a league-high 15-game point streak (18 goals, eight assists), which is already an NHL record for longest point streak by a teenager. He turns 20 on April 19. After the game, Laine repeated that he wants to grab the goal-scoring lead and will try when Winnipeg (43-19-10) hosts Los Angeles on Tuesday. While words like that could come across as cocky, that's not the case with Laine. He always honestly assesses the good and bad parts of his game and stresses his ultimate goal is helping the Jets get into the playoffs. His candid responses to questions have become as much a trademark as his one-timer blasts from the left circle. It hasn't gone unnoticed by his admiring teammates. "He's mature," veteran forward Bryan Little said. "You forget how old he is. "When he's on the ice, he plays mature and he handles himself like a veteran. He doesn't seem to care about all the outside noise and all the pressure and stuff. He just plays." Little is also impressed with Laine's ability to live his life under the spotlight. "He knows he's got a responsibility because he's so good, because he's a rising star in this league," he said. "He does it without complaint." While team staff monitor the amount of interviews and events he's part of so it's not too disruptive, no one tries to curb his candour. "I think that would be just like stupid to say to somebody to don't be yourself. That's just who I am," Laine said. "I mean, I don't need to lie to you (reporters). If you guys ask me something, I just want to say how it is. I don't feel like I have to make something up or just say whatever." His media availability has been restricted to the rink and not places such as his home. Laine has also put the kibosh on interviews with his family. His mom lives with him in Winnipeg, but she recently went back to Finland to be with his sister so his dad is now here. The whole family and his girlfriend plan to be here soon to hopefully watch the team's playoff run. "I'm the athlete, I can answer all the questions," Laine explained. "I don't feel like I have to bring my family to the media. They're just in the background." His confidence in himself is perhaps most evident in a physical way. 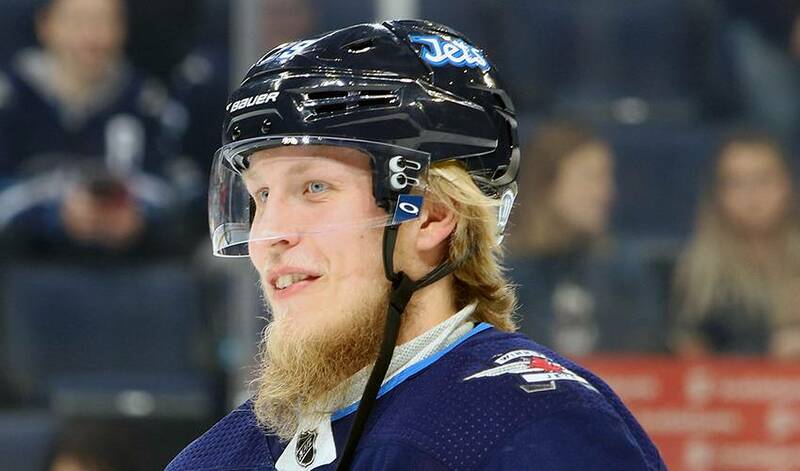 His friendly bet with a cousin to see how long they can grow beards this season has drawn jabs on social media and teasing from his teammates. "It's got uglier and uglier," Little said with a smile of the scruffy beard. "When he finally shaves it he's going to look like a new man." That may not happen any time soon with the way his season is clipping along. Keeping the beard might even turn into a superstitious habit. "Who knows?" Laine said with a laugh. "Let's see where we're at in a month or a couple more months. It might be a good thing, but we'll see."